Broom sedge is a perennial tufted sedge that is widespread in North America, and is found in most US states and Canadian provinces. 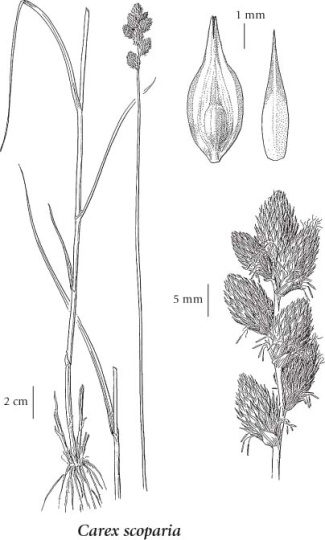 In BC, it is found in moist to wet ditches, lakeshores, marshes and meadows in the lowland and montane zones. In his rare plants of the Fraser Valley article, Lomer (2011) says: "This sedge is most abundant in BC in the Fraser Valley. It grows in wet sites that may dry out by summer's end or remain wet year round. It does well in disturbed man-made habitats such as wet fields, wet hydro line right-of-ways, roadside ditches, and boggy clearings. It can be recognized best by its leafy, clumped habit and compact to somewhat loosely arranged, often nodding, heads of pointed spikelets. It has been recorded from 30 sites in Greater Vancouver, mainly in the Burnaby-Coquitlam-Surrey area (UBC: Lomer 96-190) and is also locally frequent east to Chilliwack". Extracted from Botanical Electronic News #432, January 2011, with permission. A detailed description of this species is given in Flora North America, which recognizes two varieties: var. scoparia and var. tessellata. Perennial, tufted herb from fibrous roots; stems 15-90 cm tall, exceeding the leaves. Sheaths tight; blades flat, 1.5-3 mm wide, borne on the lower 1/3 of the stem. Spikes 4 to 12, aggregated into a 1-5 cm long ellipsoid head, unstalked, with both female and male flowers, the female flowers towards the tips; bracts subtending the spikes sheathless, reduced, the lowermost sometimes awnlike, about 0.5-1.5 cm long. Moist to wet ditches, lakeshores, marshes and meadows in the lowland and montane zones; rare in S and EC BC; E to NF and S to ME, MA, NC, GA, AL, MS, LA, OK, NM, AZ and CA.